American writer Tillie Olsen’s short story is brought to life on stage, performed as a heartfelt monologue by Anne Pensalfini. Created in consultation with Margi Brown Ash and directed by Heidi Manché, I Stand Here Ironing explores the complexity of familial relationships, especially those between a mother and her children. Standing at her post by the ironing board, smoothing the creases that she can control, Anne’s character reflects on her relationship with Emily, her eldest child, following a request for an interview with Emily’s university teacher. She reminisces about the good and not-so-good times in their life together, the sacrifices and compromises that were made and how they have woven together; she expresses her joys and regrets, her desire to return to certain moments, her guilt that she had more wisdom in raising her later children, and her amazement at the person that Emily has become despite her fears and the responsibilities and realities that she had to take on at an early age. Although the work was written in the 1960’s about America’s Great Depression in the 1930’s, the timeless struggle of motherhood, especially for poor, young, working mothers, ensured that the piece did not feel out of place in the modern day. 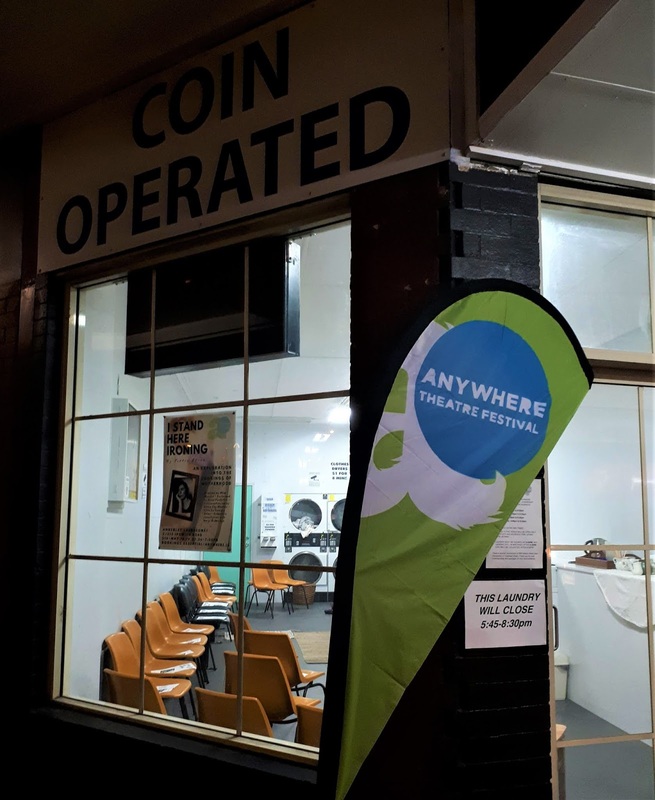 The performance is delivered in the intimate venue of the Annerley Laundromat; the audience can pour themselves a cup of tea and settle in, surrounded by the endless domestic tasks of motherhood. The closeness of the space and Anne’s use of eye contact throughout her performance made it feel like a real conversation, rather than one-sided musings. Cello music, performed live by Georgia Shine, added to the atmosphere and was used to separate trains of thought in the monologue. Following the performance, the audience engaged in a conversation about the work, facilitated by Emma Che Reathke, and had the opportunity to discuss, reflect, and share their thoughts if they wished. Anne also joined the conversation, speaking about the development process and about how she had personally interpreted certain elements of the piece. I Stand Here Ironing is a performance that warmly invites you to sympathise and empathise, and will raise questions about your own journey with mothers and motherhood. Anne Pensalfini will be performing I Stand Here Ironing at Annerley Laundromat on May 18, 19 and 25-27 at 7pm. Read more and book tickets on the event page. Review of May 19 performance.